The photo is harsh and stark in its black and greyness. 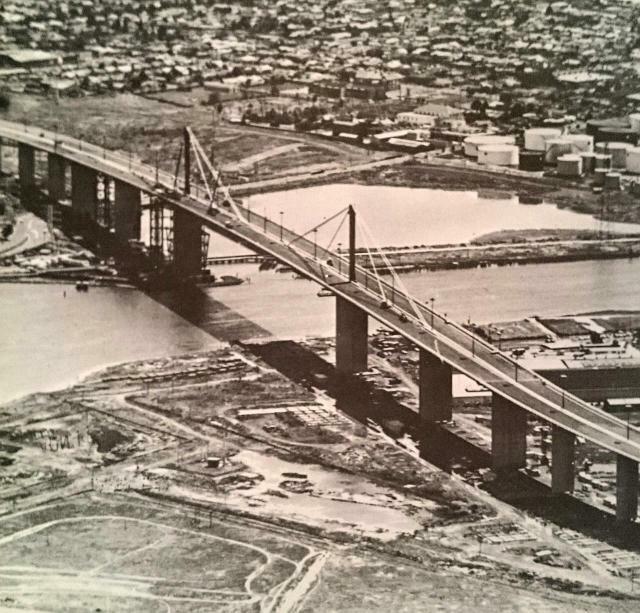 Taken not long after the completion of the Westgate Bridge, it is an engineering portrait taken from an aerial vantage point somewhere above Webb Dock. Take a look at the ground plane. All that land south of the Bridge was the domain of the Melbourne Harbor Trust. The area is scored with marks of Port activity. The photo is a status report on the environmental conditions prevailing at that time. It gives the context to Sir Oscar Meyer’s, (chairman of the West Gate Bridge Authority) wish to create a beautiful park beneath the sculptural Bridge. That required a large imagination since the landscape was so flat, so featureless! Follow that ribbon of shadow cast by the Bridge to locate the southern wetlands project undertaken by Friends of Westgate Park. For many, many years,this area known as the Howe Parade extension was a nether land of confused governance and jurisdictions – neglected, weed infested and low in biological diversity. It was a wild place, such as used to abound in Fishermans Bend but now quite rare. Over 18 months the Friends cleared the weeds, prepared and planted the site into a chain of shallow wetlands. The Friends group has recently received a substantial grant from the Port Phillip Bay Fund, a legacy of the Port lease, to enable the completion of the second stage of the project between the Webb Rail and the River. The group is also working with RMIT to survey the area to be covered by the second stage for insect diversity before any work is done, and then to survey it again over succeeding years. 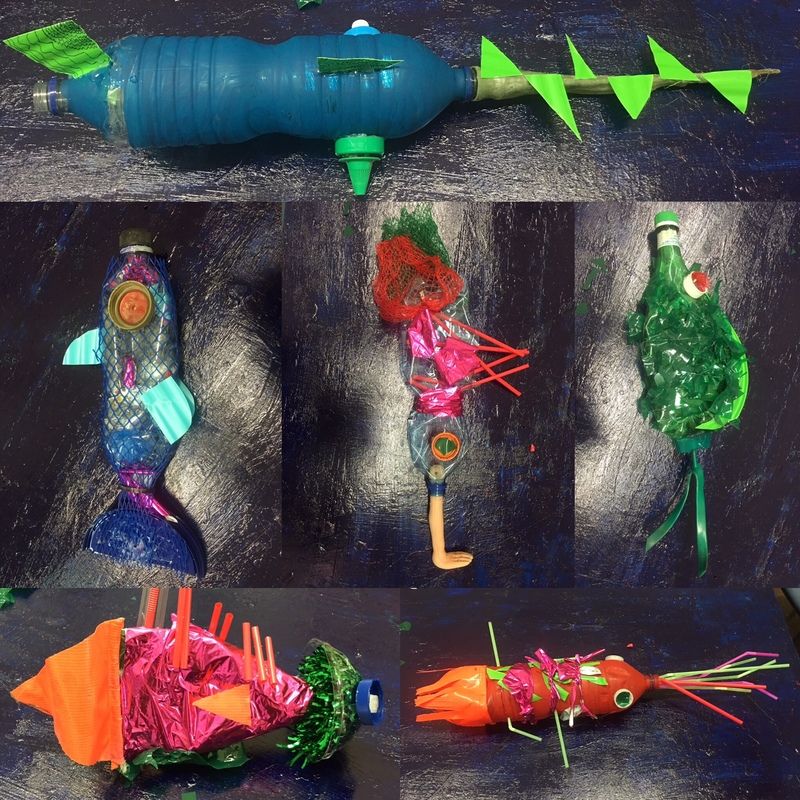 Creatures of the Bay, an exhibition of work by local students from discarded single use plastic items opens at Gasworks Arts Park on Saturday. Workshops with schools were facilitated by artist Carolyn Cardinet whose energetic creative practice I have followed from St Kilda to Ballarat to Frankston. Recently she has been weaving natural materials with plastic in a way which expresses our intricate and inescapable connection with plastic. The exhibition brings together an impressive collaboration of community groups with a shared commitment to community health as well as the health of the Bay. All these Port Melbourne cafes are replacing plastic straws with paper ones in a 3 month trial: Grey & Bliss, Station Street Trading Co, Long Story Short Cafe Hurricane Handsome, About Life, Dominos Pizza Port Melbourne, Melbourne Bakehouse and Cafe Grumento. On 8 June the report of a Legislative Council inquiry into the Environment Protection Amendment (Banning Plastic Bags, Packaging and Microbeads) Bill 2016 was tabled. The report concluded that the Committee was “not in a position to fully assess the Bill’s impact on communities, families, individuals, businesses and the environment in its current form” and recommended that a formal assessment of those matters be undertaken.